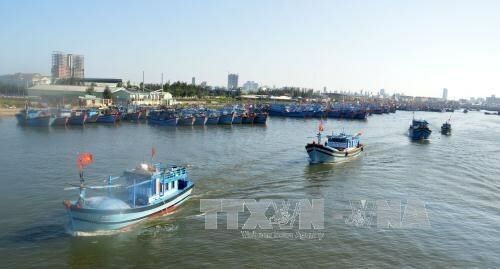 Da Nang (VNA) – The central city of Da Nang has implemented policies to support local fishermen, said Luu Quang Khanh, head of the city’s Fisheries Department. Under Government Decree No. 67/2014/ND-CP on incentives to support fishery development, eight projects on building new fishing ships have been granted preferential credit, with four ships already operational. In accordance with Decision No 47/2014/QD of the city on support to fishermen to build ships, 42 newly-built ships have been launched since 2012, worth a total 27 billion VND (1.1 million USD). The city’s agro-forestry-fishery promotion centre has supplied new fishing equipment worth more than three billion VND (131,340 USD) to more than 100 ships since 2010. In addition, Da Nang has provided insurance for 317 ships and 5,418 local fishermen, worth more than 10 billion VND (437,800 USD). Besides the construction of new ships and equipment support, the city’s Department of Agriculture and Rural Development also provided training for ship captains. Ngo Thi Kim Cuong, Deputy Director of the Agro-Forestry-Fishery promotion Centre, said that the near-shore seafood resource is on the decline despite increasing demand. Therefore, local fishermen are advised to go further offshore and modernise their equipment.